The old attitude to work used to be that we better train, improve, change and remodel ourselves to fit into the ideal job. Having tried this model for decades we have now realised that although people may want to develop, they rarely want to change. Growth at work must then be about who we are, our strengths and ambitions. We need to ask ourselves: How can I find a place in work life where I fit in with the person I am right now and then grow from there? This idea is beautifully packaged in a very hands-on way in Mike Pegg’s and Sue Moore’s new book Strengths Coaching in 90 minutes. The authors each have 35 years of experience in coaching. The book is targeted to people who need to coach other people. Most often this will be a manager but it can also be an educator, a teacher  not to mention a parent. The authors present a clear basic model of coaching. Added to this they give a large number of possible extra tools to cover many diverse coaching situations. They also present a rich variety of questions which the coach can ask the coachee. Finally, they give several in-depth real-life examples of coaching showing how the different tools can be put to use. The clarity of the strengths based philosophy behind every model, tool and exercise in this book is impressive. This is an ideal book for anyone having the role of a coach and who wants to improve their coaching skills. Strengths Coaching in 90 minutes is rich in possibilities and highly inspiring in a quickly read and intuitive format. Most likely it can show every manager or coach a number of new angles in coaching. 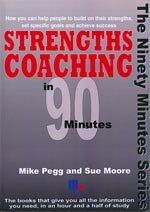 Strengths Coaching in 90 minutes, by Mike Pegg. Management Books 2000 Ltd 2006. ISBN 1-85252-500-2. 149 pages.